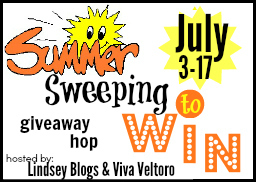 Welcome to the Summer Sweeping Giveaway Hop, hosted by Viva Veltoro and Lindsey Blogs. Summer is just getting started because it is definitely HOT, HOT, HOT outside. Each blogger in this Event has a giveaway worth at least $25 to help you stay cool and keep Summer Sweeping with this fun Giveaway Hop – so be sure to hop around to them all below including our hosts - Viva Veltoro has an amazing collection of baby prizes and Lindsey Blogs is sharing a few of her favorite brands with you! Kids love anything and everything with their names! From license plates, to stickers, to backpacks... it's all fun for them! But what about books? Can you imagine giving your child a book that featured their name and was written to them? Sounds pretty wonderful, right? This is just what I See Me! provides with their amazing personalized books! I have had the chance to work with I See Me! a few times over the last few years, and my son has always been thrilled when a new book had arrived, just for him! He loved going through each page and finding his name, incorporated not only in the words of the story, but also into the gorgeous artwork. Still, I couldn't help but wonder if perhaps after this time the fun of a personalized book had worn off for him. But when I gave him the opportunity to choose another book recently, I quickly discovered that was not the case! 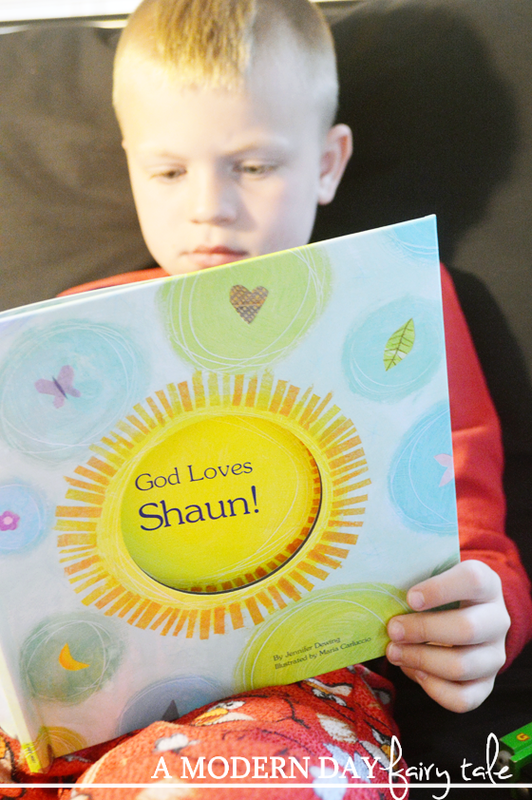 He could not wait to start browsing and find that perfect 'all about Shaun' book to add to his collection. 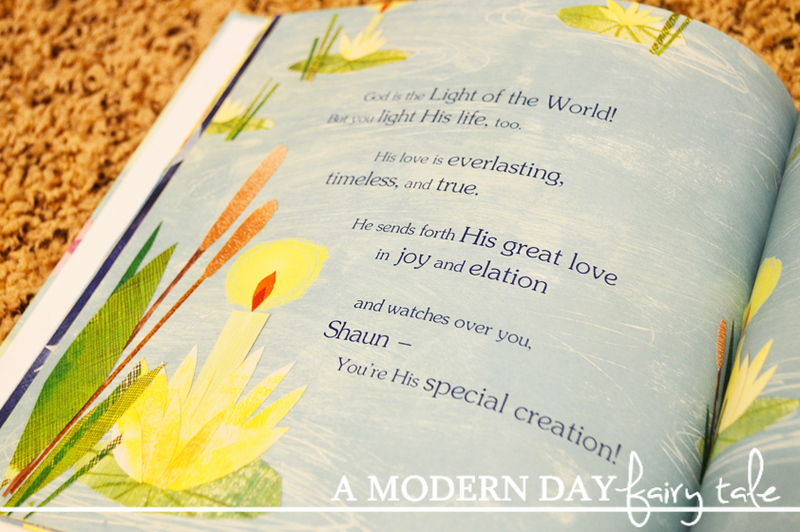 It didn't take long for him to land on the perfect book for him, God Loves You! In the past, the books he had received from I See Me! were all about teaching lessons. He had a book on being a big kid that reminded him of important life skills like brushing his teeth, using the potty, etc. He had a book about sports that taught him how to be a team player, follow the rules and show good sportsmanship. These were all wonderful lessons that served as a type of social story for him as well. By putting him into the story, he helped to really make those ideas much more personal to him- something that is very important for kids on the autism spectrum like my son. And what greater lesson could there be than teaching our children that they are loved by God? This is exactly what this book does. It reminds our little ones that they were created by God and the He loves them unconditionally- when they succeed, when they fall short- always. Of course, most kids 'know' this...just think about the song, "Jesus loves me, this I know..." BUT when you hear that phrase or hear that song, it doesn't always register as something personal. 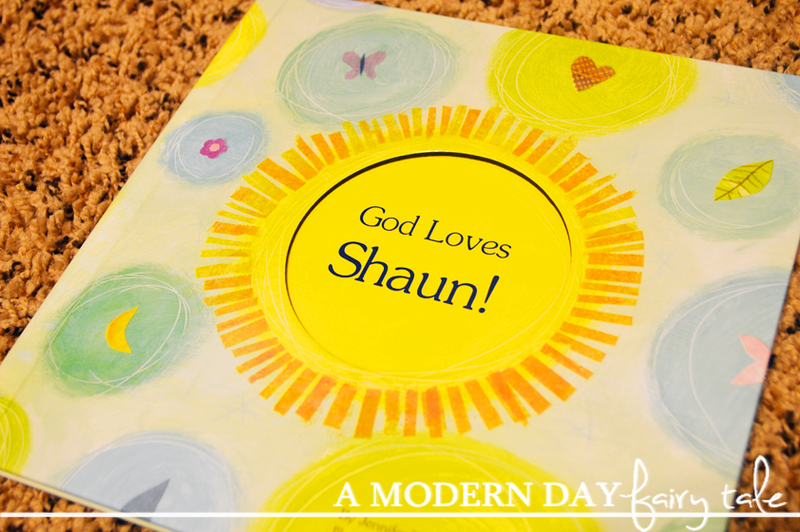 When you have a book like this that says God loves YOU, Shaun; God created YOU, Shaun...it MAKES it personal. It takes away the abstract and put it on a level that all kids can understand- again particularly important for kids like my son. Winner will be contacted via e-mail after giveaway ends, and will have 48 hours to respond before a new winner is chosen. One entry per household, winning entry will be verified. Odds of winning depend on valid entries received. A Modern Day Fairy Tale is not responsible for prize delivery So Easy Being Green, Viva Veltoro, and the Summer Sweeping participating bloggers are not responsible for sponsors who do not fulfill prize obligations. We gave or grandson the Who Loves me book and it is one of his very favorites! I really like My Very Own Fairy Tale Storybook. I love so many of these books, it is hard to choose! I think my favorite right now is the "My Very Own Name" book! my favorite is the M is for Me book!! I really like the My Very Own Fairytale book - my niece would love that, I'm sure. I like the Goodnight Little Me Storybook. I like the My Very Own Name book. I love them all! I have my eye on the I wish You More book, but there is an A B C book about your child too that I like really well! I would love to get the princess book for my daughter. I would love to get My Very Own Fairy Tale, My Little Book of Blessings, or Good Night Little Me. I love the "I can change the world" book!! There are so many great choices!! I really like the ABC What I can Be book! I would love to get the The Super, Incredible Big Brother. My grandson, Nolan will become a big brother sometime in August. I love the M is Me book! My Very Happy Birthday Book for a girl. I like the My Farm Friends Personalized Book for my grandson. My daughter would love to have the My Very Own Fairy Tale Book! I love the "My Very Own Fairy Tale Book"! So cute! The premium cost cash. Payday advances costs more contrasted with other money credits.